Who is, or has been, the biggest influence on your art? Hands down, my parents have been the biggest influence on my art. Their love for modern design and contemporary art rubbed off on me! They were also the ones to encourage me when I first started experimenting with painting in 2009 and commissioned me to paint anniversary and Christmas gifts for their home. Since my dad’s death in 2012, I am definitely influenced by the bittersweet feelings of nostalgia for the rural area where I was raised, and I continue to paint with an appreciation for the natural world. My mom is still my biggest fan and enjoys supporting me at all of my art events. Also, I love seeing the paintings of abstract artists up close in galleries and museums, and noticing their brushstrokes and layers, imagining how they painted. I am most inspired by the imperfections - the unintentional drips, blobs and messy edges. These details give a piece so much soul, and allow me to see the artist in the work, and that has given me the permission and desire to show myself in my paintings. Which of your works is your personal favorite and why? Ah! Only one? I think it’s a tie between ‘The Big Lake’ and ‘November’. Both are primarily soft in color with reveals of stronger color underneath. ‘The Big Lake’ (16x16”) was my first abstract landscape, and was totally spontaneous and experimental. 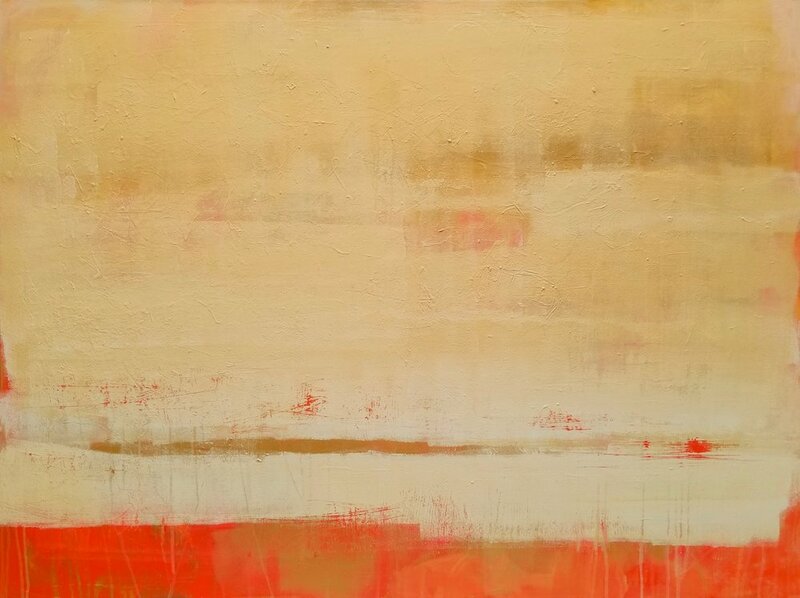 Layered and moody, it has a few dabs of metallic paint flitting across like the last notes of a song. And ‘November’ is a much larger version (5x6 feet!) with feelings of solitude and peace. It’s quite meditative to look at, and I find its barely there imagery a little mysterious as well as hopeful. Collectively, my Horizon series of paintings seem to have a calming effect on others too! Of all your travels, which city or place inspires you the most? Why? Honestly, most of my inspiration comes from Minnesota. I am easily inspired - the artist version of a cheap date! But! If I had to pick somewhere outside of our lovely state, I can still channel the French countryside from my days as an au pair in southern France. Those rolling hills and big skies! My creative process begins with inspiration. It may be as simple as seeing an interesting color combination in nature or hearing a new song that evokes a mood I want to recreate. Then, it’s about making time to really get into it… I prefer to block off a large chunk of the day to concentrate on a piece and hate to quit before it feels good! 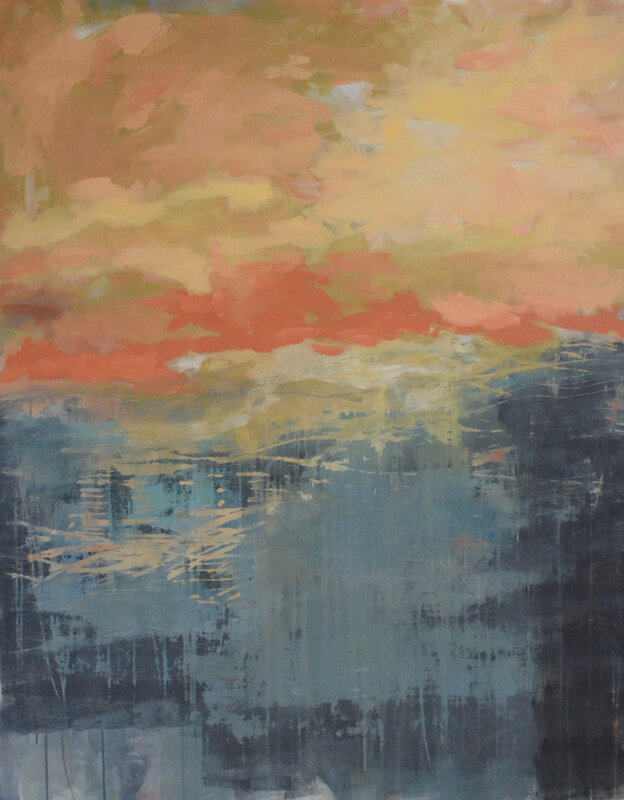 Large scale paintings allow me to paint intuitively, and experiment with different techniques. There’s more freedom to take risks, and often my pieces have several reworked versions layered beneath. What is something quirky or unexpected about you that most people don't know? 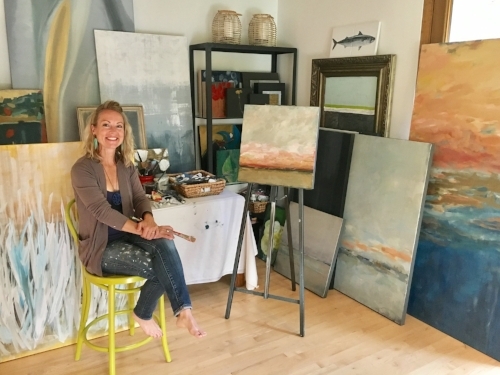 I don't limit my painting to canvases… My projects have included shirts, throw pillows, and when our oatmeal-colored sofa looked blah next to the white walls of our new home, I painted it charcoal gray. Not sure if I would recommend sofa painting, but it was an inexpensive fix until we could afford a new one! I have become more confident, but more demanding of myself, happily dedicating greater amounts of time to creating art. I have been learning primarily through experimentation and want to expand on that with other types of art enrichment. 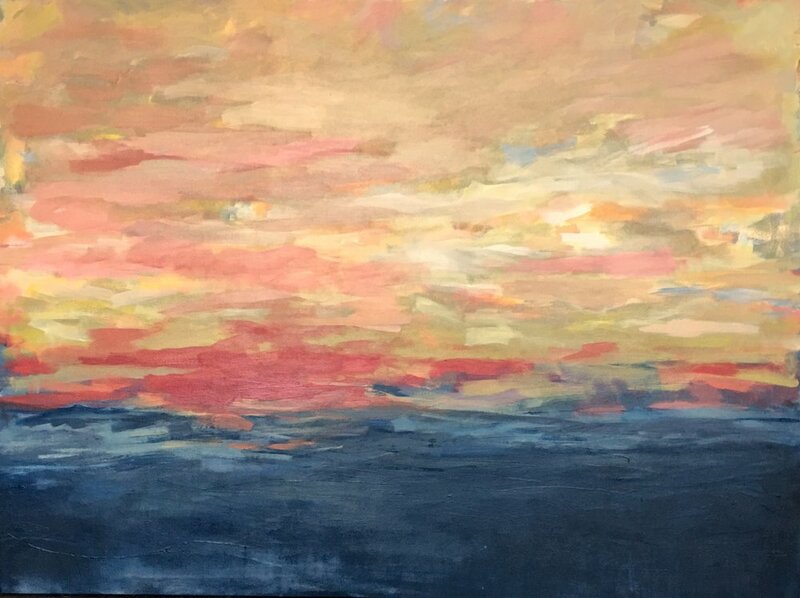 My experiences with more established artists have greatly enhanced my practice, and have made me feel welcome in the vibrant art community here in the Twin Cities.